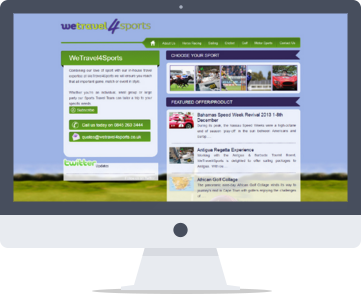 We Travel 4 Sports is a leading sports travel company, offering travel expertise for major sporting events across the world. Including sports such as Football, Cricket, Golf and Rugby - We Travel 4 Sports have worked with some of the UK's top sporting teams to arrange travel and accommodation for individuals as well as business. We Travel 4 Sports is a leading sports travel company, offering travel expertise for major sporting events across the world. Including sports such as Football, Cricket, Golf and Rugby – We Travel 4 Sports have worked with some of the UK’s top sporting teams to arrange travel and accommodation for individuals as well as business. We still offer support on a continuos basis and manage their website hosting and email management system.